A self guided trip is an ‘on-your-own’ adventure where you set your pace with the local support of our partners. You will be given detailed maps and descriptions including tips on restaurants, things to see and do etc. that will fully equip you to explore on your own. You will have access to a 24/7 emergency contact and your bags will be transported to your next overnight accommodation. You will have the freedom to decide when to wander, where to rest and how to soak up the countryside. A guided trip, on the other hand, means that you will be with a trained guide, who will look after all the logistics, tell you stories about the places you will visit, share their knowledge about the fauna and flora you will encounter and more. In all possibility you will be part of a small group and best of all – the logistics will always be looked after as your daily plan is chalked out by your guide. The inclusions on both vary and so do the costs. Some of our travellers like to be on their own, while some thrive in the company of friends and strangers and even like the security of having a guide. The Active Holiday Company offers both guided and self-guided trips, however, in certain destinations we may be able to offer only guided or only self-guided trips. On Your Feet trips include a range of challenge levels and though many are very comfortable for people of all fitness levels, some are designed to satiate the human desire to achieve. Generally speaking the walking and hiking trips are easier than the treks and these in turn are easier than intense activities like skiing etc. However, what makes rating these trips is not just the distance and the terrain, but things like the weather, the duration of the trip and even the facilities en-route. For this reason our grades on this section are only an over-simplified guideline and we urge you to contact us if you are unsure. Grade 1: Range of 2 to 4 hours of walking, on mostly flat terrain, on easy trails – good for people of all abilities and ages. Grade 2: 4 to 6 hours of easy walking a day, at times on hilly terrains or through areas where paths are not well established. A reasonable level of fitness will serve you well. Grade 3: Enjoyable challenge for the fit with some days of walking that can be over 5 hours, can include somewhat challenging climbs or are over rocky paths. You do need stamina, this is not for those who have fear of heights. Grade 4: Strenuous, can include climbing to uncomfortable altitudes, 6 to 7 hours of being on your feet every day on mountainous terrain and can offer limited facilities en-route. Grade 5: Very challenging and appropriate for those who are in excellent level of fitness, these are difficult treks may even need you to carry your own backpack through difficult altitudes. You may need special equipment and preferably experience. Despite our best efforts to grade the trips, please remember that not all days will be alike on these trips – some will be more difficult or easier than the others. Speak to us if you are in doubt. Unlike a cycling trip where your luggage transfer from hotel to hotel is taken care of, on a hiking or trekking trip, the situation can be very different. In some cases, porters will arrange for your bags to be taken to your next overnight hotel and at times the luggage transfer may be done using vans. However, this depends on the trip and the destination. For example, in Asia a trek may come with a baggage transfer, however in Europe some trips may include this service while most may not. At times you may need to transport your luggage yourself. Please contact us for details on specific trips. If baggage transfer is included, you will be requested to keep your bags out at a certain time. 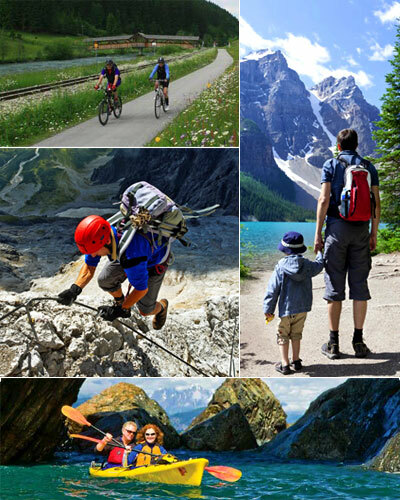 There are luggage restrictions on hiking, trekking and other On Your Feet trips. Usually, you will be allowed 20 kilos, however, on some of the other trips – particularly treks that include climbing heights; this may be restricted to as little as 15 or even 10 kilos. Please ensure that your luggage is handy for the type of vacation you are choosing. Bags with wheels and hard suitcases are a bad idea on such vacations even though the daily handling may be rough. Though it is safe, please note that we take no responsibility for the contents of your luggage and damage to it. We strongly recommend that you carry along a small back-pack for day. Apart from trying to provide accommodation that is comfortable at the end of a day, we strive to include hotels, country or mountain lodges, lodging cabins, tea houses and guest houses that give you a flavour of the destination. Occasionally we may surprise you with some-what luxurious standards, however, you will know the exact type of accommodation at the time of booking. Private facilities with attached shower and toilet are standard in most cases though on some alpine adventures you may even stay in dormitories with shared facilities. On some vacations, we will offer you the opportunity to upgrade though even then in smaller towns and villages, the level may just meet acceptable comfort. Giving up some of the luxuries is often considered part of the adventure and we like to support the small, family run places as they are more personal and it helps us to support the local economy. Single rooms are fairly difficult on treks and hiking vacations due to the limited supply of rooms and may not always be possible. We will let you know before you book, when this situation is likely. Extra nights as well as tour extensions are available at the start and end points of most trips. These can be booked before or after booking your main trip with us. Please contact us for extra night prices. Some of the shorter trips can be combined with other trips or you can also consider another travel style for the rest of your trip, making cycling a part of it. To be honest, we try not to standardise anything. We want you to discover the destination and enjoy it for what it is. And that can mean that you simply go with the flow and at times take the differences in your stride not judging – for example the standards in Asia are not comparable with those in Africa and even within Europe there is a huge difference between the standards of Southern Europe compared with Northern Europe. Yes, that is one of those things that is not in our control but we don’t think folks getting on an outdoor adventure would be very fussy about that – having to rough it out is part of the adventure. Though, we recommend that you be prepared for cooler temperatures, sunny days and the rain. Our travellers come from all parts of the country. Some like to extend with more touring and sightseeing, others prefer to book online and at times they even like to use their miles for discounted travel. It is always easy to add flights and we can do so if you would like us to, even if our trips are priced on ‘land-only’ basis excluding airfare. You will receive detailed information about how to get to the starting point of your trip. In most cases, in Europe, public transport including buses and trains will get you there. In some cases we may need to arrange airport transfers. These are not always included in your trip price and if you require these, please contact us. In Asia, where the public transport system may not be reliable and easy to follow, we have tried to include airport transfers in your trip price. Depending on the type of trip you are taking you may or may not need special equipment. What equipment you will need will also depend on the destination. On some trips, even in the case of skiing, your equipment need not be carried and can be locally hired at a reasonable cost. On the other hand some trips may need you to arrive completely prepared with full mountaineering equipment or special type of clothing / footwear etc. No matter what type of trip you choose, we will be able to advise you before you book and give you a comprehensive packing list before departure. To take one of these trips you must know how to read maps, have some prior hiking experience and the ability to hike as per the rating of the trip. If anything goes wrong and you need help you will have an emergency contact whom you can get in touch with Should something go wrong, however, you can always call the emergency contact number and help will be close by as our network is spread across destinations and we only work with partners who have a local presence in the destinations we promote.